It’s been a while since the last part of this rather occasional series (!) so we thought it was about time to look into another subject which has been causing concern in the alternative press over the last few years. Yet again, it sounds like a great idea – something to make life easier AND save time on the least popular household chores – but are we paying too a high price for this convenience? Non stick cookware or, as it tends to be generically known, Teflon. As so often is the case, the story behind Teflon is intriguing; as are the myriad of everyday products it’s now found in. The story starts in 1938 with a chemist called Dr Roy Plunkett who was working for DuPont in America. While carrying out experiments with Tetrafluorethylenes (TFE) to find new chemicals to act as refrigerants he discovered a new chemical, Polytetrafluoroethylene (PTFE), which turned out to have some very interesting properties. To start with PTFE was found to be extremely slippery. At the time it was one of the slipperiest substances known to man. Even better, it was chemically stable, having a very high melting point. It was also non corrosive. Three years of research later and PTFE was patented as a non stick coating by DuPont under the name of “Teflon”. When it was first sold in the mid 1940’s, the cost of production meant that it was limited to industrial and military uses. By the 1960’s it had started to be found in the consumer market in products such as stain repellent fabrics and electrical wire installations. Shortly after this came Teflon’s best known use, non stick cookware, particularly saucepans, frying pans, baking trays and cake tins. And it’s this use we’re going to focus on today. Coming up to the present day, Teflon can be found in a whole myriad of products ranging from windscreen wipers and stain repellent carpets / furniture to various hair care products and industrial lubricants and propellants. While Teflon may have been the initial discovery, there are now a huge number of similar chemicals developed by other companies. Many of these names are just as well known as Teflon. Scotchguard. Stainmaster. Xylon. Why is there concern over such a useful discovery? Concerns fall into two main categories. First there’s the production of PTFE itself and, in particular, the use of another chemical known as Perfluorooctanoic acid (PFOA) or C8 during this process. Second, is the use of the finished product itself and, in the case of cookware, the effects of repeated heating during its life time. Without going into unnecessary detail, PTFE is synthesised under high temperatures from a number of chemicals including fluorspar, hydrofluoric acid and chloroform. The result is a gas which is extremely flammable, making it dangerous to transport. This means that PTFE has to be produced and stored on site as a liquid at a low temperature. It’s then applied to the final product, along with other chemicals including PFOA, before being heat treated to complete the process. In the case of non stick cookware this is done several times to ensure that the coating adheres to the metal cookware. Manufacturers claim that by the end of this only trace amounts of PFOA can be found in the finished product. While this may be the case, there is concern as to how easily PFOA passes into the environment and, once there, how difficult it is to remove. It also passes easily into the blood stream, with the screening of employees at DuPont factories finding high levels of PFOA in their blood. More worryingly, studies into the spread of PFOA across America have found PFOA present in 98% of blood samples of the entire population. A long running case in America has focussed on PFOA and its disposal by DuPont into landfill sites. Back in the 1980’s a farmer, Wilbur Tennant, sold 66 acres of land to DuPont to use as a landfill for waste from a nearby factory. Within a very short time both his family, their livestock and those in the area started to suffer from health problems that no one could explain. Roll forward another 20 plus years before the resulting court case finally found that PFOS and DuPont were responsible for these health problems. Sadly this is not yet the end, but simply opens up the way for those affected to sue DuPont. It’s expected that this process will take many years, so yet more delays for those concerned to finally receive compensation. What about the non stick cookware itself? 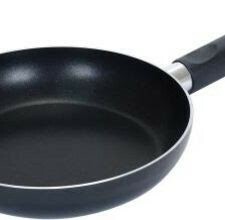 Studies have found that PFOA and other hazardous toxins are released when non stick pans are heated to high temperatures. Toxic gases are detectable at temperatures of 680 degrees Fahrenheit; airborne particles at temperatures as low as 464 degrees Fahrenheit. While these may sound like very high temperatures, they aren’t that hard to reach if you leave a saucepan or frying pan on the cooker for a while or heat it up on a high setting. Contrary to popular belief, you don’t need to use metal utensils on your non stick pans for them to be dangerous. What risks are we talking about? In the short term high temperature cooking with these pans – say, searing a steak – can lead to a condition known as “Teflon Flu” as a result of inhaling the gases released during the cooking process. Symptoms are similar to those of Flu including headaches, chills and fever, along with coughing and chest tightness. As they don’t tend to develop for a few hours after exposure, few people make the connection. Longer term exposure to PFOA has been associated with increased cholesterol, uric acid levels, preeclampsia, heart disease, liver damage, thyroid problems, neurological disorders, chronic kidney disease, reduced fertility, testicular and kidney cancer. Of particular concern are the effects on children, with a study of 10,000 children living downstream from a DuPont chemical plant on the Ohio River finding that those with the highest levels of PFOA were more likely to have thyroid disease. Since thyroid hormones play critical roles in metabolism, growth and brain development, small changes in them during key developmental periods could have long term effects on children’s IQ and motor skills. As always the question is quite simple. Are the risks associated with using non stick cookware worth the convenience of a little less time spent washing up? Especially as there are plenty of alternatives, with stainless steel and ceramic cookware being the most common. And this means not only saucepans and frying pans, but also the non stick trays and cooking tins used in the oven. The focus on this blog is always on helping you to make small changes every day to improve your health and wellbeing. Not only is this an easy change to make, but one with long term benefits for the entire family.